So, I haven’t updated since December. I spent most of the holidays driving all around the Western US, and didn’t get any work done on the bench. December starts “gift season”, which doesn’t end until early March, so most of my shop time went to turning gifts, but I did get the deadman runner and deadman made in January, followed up with some benchdogs in early February. 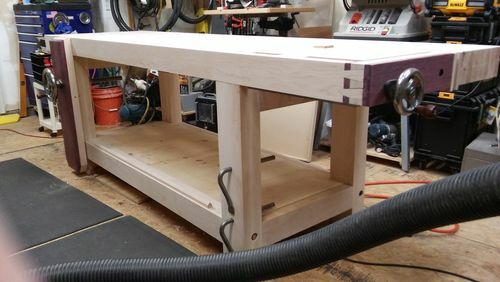 In late February I started on the filler strips for the gap, and this past weekend I drilled the holdfast holes in the front slab and holdfast storage holes in the right front leg. Nothing special about any of it. Then I attacked the top with my previously unused Bosch ROS65VC Random Orbit sander with the 6” pad. 80 grit Mirka Abranet made quick work. Effectively, the workbench is now done. It is fully functional. 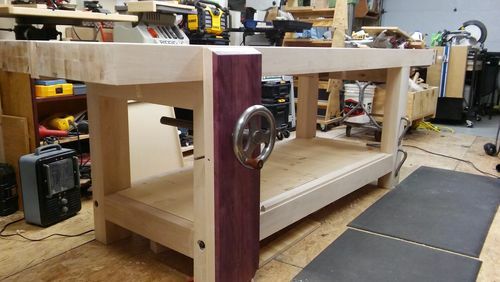 I still have to make some new bench appliances for it, and I plan on reshaping the leg vise chop. I’ll likely make a new deadman, as the one I made isn’t wide enough, so it doesn’t like to slide along without tipping and binding. Before I do that though, I’m going to try adding some UHMW strips to the deadman’s wear surfaces to see if that will resolve things. And I’m going to build storage “chests” to go into the base. Two for the backside, two for the front side. BDad, did you try paraffin wax on the deadman runner? Currently, there’s neither finish nor wax on any part of the bench. The problem with the deadman is similar to the dangers of crosscutting on the tablesaw a piece that is significantly longer than it is wide without a miter gauge/crosscut sled. I see what you mean. Mine has a width to height ratio of almost 1:2( 9”x20 1/2”). What about a decorative outrigger?